kim watson ★ design ★ papercraft: I need this so badly. I need a new craft area/ room. I am busting out of my little space, that was ample 2 years ago....but now I am pulling my hair out trying to keep everything tidy & in it's own place. For me a tidy craft area means a fog free brain. Hmm! what to do...what to do....? If I had a gazillion $ stashed somewhere...I would want something like these. Golly look at this storage! Love the blue & red colors...so fresh! Love the patterned wall paper. This one is my fave ever! I love how the storage is so accessible. Have a rockin' Thursday guys! Ooh, I love all of these. Perfect for inspiration as I'm trying to decide how to lay my little room out! 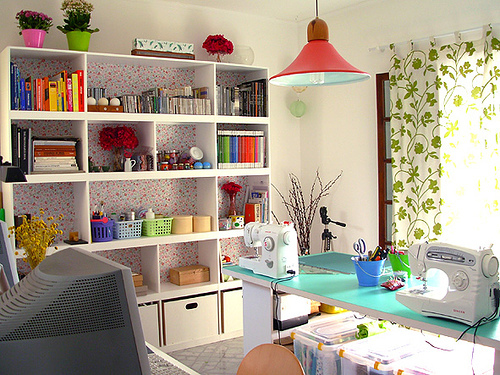 I so want to redo my craft area. I just need to take time & redo some things! 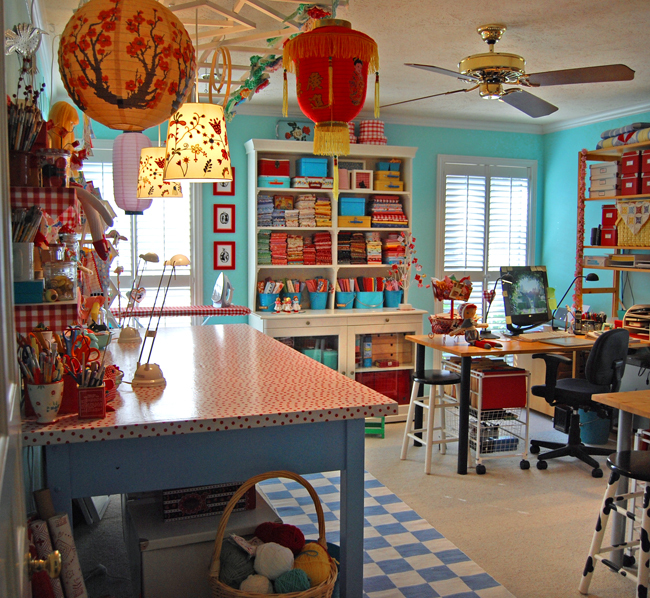 I have the perfect large attic space, the bursting at the seams amount of craft supplies...now I just need one of those makeovers too! ;) Goodness! Wouldn't that be FABULOUS! I'm totally with you Kim, wow what gorgeous rooms!! Love that turquoise and red one...polka dots...so pretty. Maybe you need to get rid of some of your stash? Yeah, I hear ya, KJ. I'm working out of the bottom three shelves in my linen closet and the floor of our home office. :P My craft room is our bedroom right now while we're finishing our remodel. In just a few short months, I'll be able to make a happy, organized space.... until then, I'll drool over the collection you've compiled here. YUM!! !